We put the flavor of an everything bagel in a jar for you to put on eggs, mozzarella, tomatoes, salad, fish, chicken and, well, everything! Our Pure Sea Salt blended with white sesame seeds, poppy seeds, minced garlic, and minced onion. 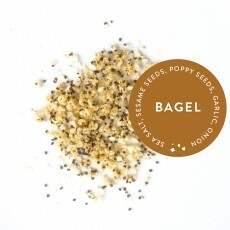 Our Everything Bagel Salt is a delicious, casual and fun salt blend to be used with ... everything! We dressed a piece of salmon sushi with this blend and it was magical. It reminded us that "fun eating" can be as important and sometimes as satisfying as "fine dining." This finishing salt blend is a favorite on our breakfast table (think avocado toast) and with grilled burgers. Available in 1-ounce and 2½-ounce net weight sizes, each in an attractive glass jar that looks great on a countertop.